* If I’m not mistaken, commissioner Bud Selig took the “boys will be boys” approach to the controversy regarding Kenny Rogers and his dirty hand during Fox’s pre-game show. In an on-the-field interview with the always-entertaining Penn alum, Ken Rosenthal, Selig said that if Tony La Russa didn’t do anything about it, why should he? 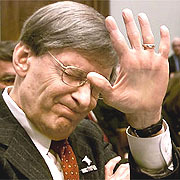 Selig said that La Russa has been known to be combative. What Selig and player’s union president Donald Fehr were with Rosenthal for was to announce the new labor agreement that will last through the 2011 season. Selig called the new deal “historic.” You know, like the Treaty of Versailles. Much to our surprise, Kennedy was just as dismissive of the Rogers controversy. Could you imagine what Kennedy might say if he were in Uganda with Idi Amin when people just started disappearing. Yes, I see how silly it sounds comparing a brutal, homicidal dictator to a baseball pitcher with dirty hands and an apologist announcer. Better yet, it reminds me of one of my favorite Tug McGraw quotes. My favorite Tug quote is when he was asked what he would do with the money he got for making it to the World Series with the Mets in 1973. * I had Nate Robertson on my rotisserie team this season, Game 3 was the first time I saw him pitch. He’s a lefty… imagine that. He wears glasses, too. He’s also No. 29 like 1968 World Series hero Mickey Lolich and has been driving the same car for a really long time. At various points of the season, I also had Jason Isringhausen, Anthony Reyes, Jason Marquis, Preston Wilson and David Eckstein of the Cardinals, as well as Pudge Rodriguez, Craig Monroe, Brandon Inge and Sean Casey of the Tigers. I finished in ninth place of a 12-team league. * Richard Ford’s new novel The Lay of the Land is out. This is the third of the Frank Bascombe series, which includes The Sportswriter and the Pulitzer Prize-winning Independence Day. The reviews look good, which isn’t too surprising since Ford is a bit of a media darling. Nevertheless, I’m anxious to dive in. * I had the chance to tune into the radio broadcast of the start of the game while running an errand. ESPN radio’s Jon Miller and Joe Morgan handle the call on radio, which is filled with much more insight than the TV version. Yeah, I know a lot of people are not fans of Morgan’s work for ESPN, but there were a few nuggets from Morgan and Miller that the more superficial TV broadcast would miss. This is no fault of TV, I suppose. After all, if someone is listening to the World Series on the radio they are seeking it out. A non-baseball fan isn’t going to drive around and listen to the game, though that same non-fan person could tune in on TV. You know, maybe the batteries on the remote died or something. Anyway, Morgan and Miller pointed out that Preston Wilson could be the key for the Cardinals in Game 3. The reason? Wilson is in the No. 2 spot of the batting order, one place ahead of Albert Pujols. It would be Wilson’s job to ensure that the Tigers cannot pitch around the fearsome Pujols. Yet because Wilson is hitting ahead of Pujols, the duo pointed out, he should get a lot more pitches to hit than if he were batting in front of, say, Jim Edmonds or Scott Rolen. Plus, they said, Tony La Russa likes for someone with some power to hit ahead of Pujols in the No. 2 spot. That’s why Wilson is so important, the announcers said. This is interesting, though if La Russa likes power in the two-hole, why not try Edmonds or Rolen there. Certainly they both have much more power than Wilson and strike out a lot less, too. * In the first inning after Robertson came up and in to Pujols, Morgan made a joke. “Looks like that one slipped. Maybe he needs some pine tar?” Morgan said.